A US woman convicted of helping left-wing rebels in Peru has defied predictions of many Peruvians and returned there after a visit home. 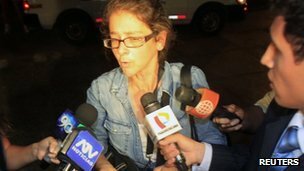 Lori Berenson, 42, is on five years of parole in Peru after serving 15 years of a 20-year jail term. Judges permitted her to make her visit home in a move that sparked controversy among Peruvians, including President Ollanta Humala. She took the two-year-old son she had in jail with husband Anibal Apari. Berenson arrived in Lima on a flight from Newark airport in New Jersey at 23:40 local time on Thursday (04:40 Friday GMT), Efe news agency reported, without responding to waiting reporters. Berenson's release on parole last year drew heavy criticism in Peru, and she was initially prevented from leaving the country by officials who said her paperwork was not in order. But she eventually did leave and now 17 days later has arrived home - well before the judge-imposed deadline of 11 January. The daughter of university professors from New York, she travelled to Central and South America in the 1990s. In Peru, she became involved with the Tupac Amaru Revolutionary Movement (MRTA), which robbed banks, kidnapped and killed a number of people in the 1980s and 1990s. Berenson was arrested in November 1995 and accused of gathering information for a rebel plot to kidnap members of Peru's Congress and exchange them for imprisoned rebel leaders. She was convicted of treason by a military court in 1996 and sentenced to life in prison. But amid US government pressure, Berenson was retried in a civilian court and found guilty of the lesser crime of terrorist collaboration. While in jail, she became known as an accomplished baker and participated in inmate talent shows, reported Reuters news agency. She married Mr Apari in 2003 and their child Salvador was born in May 2009, according to Free Lori, a website run by supporters.